City recently welcomed representatives from the Wolfson Foundation for a tour of the Clinical Skills Centre facilities at its School of Health Sciences. As part of the tour, students showcased the centre’s Triathlon T3 Precision radiography system. It was obtained through a generous donation of £150,000 from the Wolfson Foundation granted in June 2017, and was installed in the Clinical Skills Centre in January this year. Since then, the new radiography system has facilitated simulated practice sessions for over 60 first year undergraduate students. These sessions have offered students the opportunity to gain experience and confidence of using equipment that reflects the type of x-ray sets that they encounter during their first practice placements. Lin Richardson, Deputy Chief Executive & Head of Grants, and Amanda Thomson, Communications and Events Manager, (pictured, right) both from the Wolfson Foundation, got some hands on experience with the new system. "On behalf of current and future City students, we would like to give a huge thanks to the Wolfson Foundation for their generous donation. Having the latest equipment in our radiography skills suite means we have the opportunity to prepare and fine tune our technique before heading out onto placement and gives us the confidence to showcase our abilities at future interviews". The equipment has also enabled more flexibility in teaching, as it delivers high quality images, faster than before. After the tour, a session was held with City’s President, Professor Sir Paul Curran, Professor Debra Salmon, Dean of the School of Health Sciences, Dr Sophie Willis, Programme Director for Undergraduate Radiography, and Dr Ricardo Khine, Divisional Lead for Midwifery & Radiology. The session was held to both thank the Wolfson Foundation and to further share how the new equipment will benefit the university. 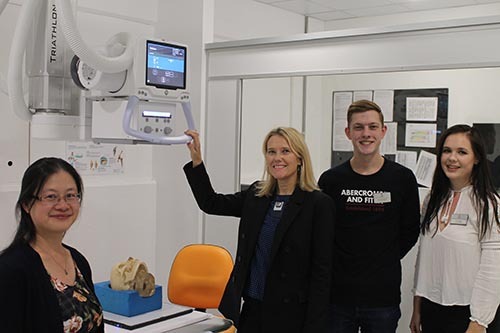 City, University of London has one of the leading radiography departments in the field, and Wolfson is pleased to have supported their state-of-the-art radiography equipment to better prepare radiography students for clinical placements, and a career in the subject. We wish these students well, both with their training and their clinical posts. Professor Debra Salmon said: “In this year’s National Student Survey, City was ranked first in London for overall student satisfaction in Medical Technology, and the consistently high league position of our undergraduate Radiography and Radiotherapy programmes also reflect our high-quality teaching and student experience in this area. Dr Sophie Willis said: “The new equipment has enabled our students to benefit from cutting-edge technology and ensure that they are fully prepared to embrace all learning opportunities and emerge from the programme confident to successfully apply for their first clinical jobs. Facilitating the teaching sessions has become more flexible and seeing the students’ confidence increase has been extremely rewarding”.